Judicial power poses a dilemma for democratic societies: judges exert political power but typically are not democratically accountable for their use of it. This book is a comparative study of the discipline and removal of errant judges in four Western nations--France, Italy, England, and the United States. Democracies place a high premium on maintaining the appearance of judicial independence, and formal mechanisms ensuring it normally include lengthy and secure tenure and adequate salary. Federal judges in the United States come close to absolute independence, since they serve in their position for life; in more than 200 years, only seven have been removed from office. Still, democratic theory requires that the service of public officials always be temporary and conditional. This book shows how each of the four countries views accountability as proportionate to power. English, French, and Italian judges cannot challenge the democratic authority of the state, and their accountability is less democratically maintained. In the English system, discipline is the prerogative of Parliament; the French largely police their own ranks. In the United States, where judges wield considerable power, they may be removed through election in many states or through the actions of elected political representatives. The book concludes that the tension between democratic goals supports a rationalizing principle for nations tilting in favor of either accountability or independence. 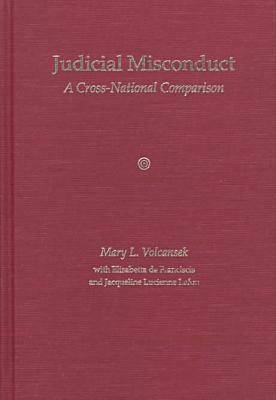 Mary L. Volcansek, professor of political science at Florida International University, is the author or editor of several books, including Judicial Impeachment: None Called for Justice and Judicial Politics in Europe: An Impact Analysis, and has published articles in such journals as Comparative Political Studies, West European Politics, and Judicature. Maria Elisabetta de Franciscis, assistant professor of political science at Universita di Napoli, Federico, II, is the author of Italy and the Vatican. Jacqueline Lucienne Lafon, associate professor of law at Universite de Paris, XI, is the author of two books in French and, with Mary Volcansek, of Judicial Selection: The Cross-Evolution of French and American Practices.